What should we be worried about? Real Scenarios that keep scientists up at night. This is the question John Brockman (the publisher of Edge.org) has asked to the world’s most influential scientists and scholars.He asked them to disclose what worries them about the future and keeps them up at night. The result is a collection of 150 bite-size nuggets from the world’s greatest thinkers discussing global problems. The subject fall into some predictable categories such as the dangers of our dependence on the Internet and the possibility of a technological singularity and how technology could change our children;s brains, but also cover some not on the ‘popular’ radar yet. Tim O’ Reilly (Founder of O’Reilly Media) worries about the rise of anti-intellectualism and the end of progress. Daniel Dennett (Philosopher and cognitive scientists) discusses his worries about how unprepared we are in the event of a long-term disruption of the Internet. Stanislas Dehaene (Neuroscientist) worries about how long will it take neuroscience to crack the lockbox of his mind. Brian Eno (Artist) talks about his concerns over our lack of engagement with politics. Roger Shank (Artificial Intelligence theorist) is concerned about our society’s glorification of stupidity and the refusal to think hard about real issues. 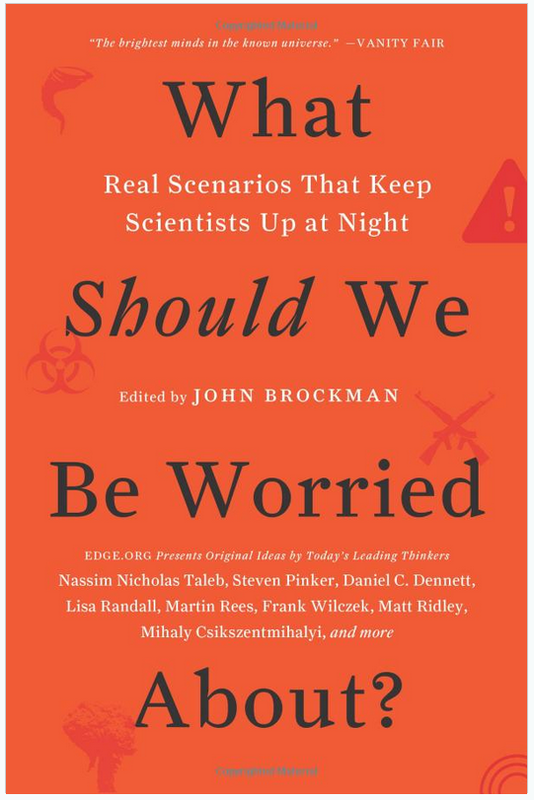 Other ‘nightmare’ scenarios in the book include the worries about the culture and cognitive consequences of electronics, the belief or lack of belief in free will, the future of peer-reviewed science publishing, political extremism, declining cultures and many more.